If you haven't heard of etching cream, you need to get your eyes over to Amazon or a craft store pronto. You know those expensive looking vases and things at Things Remembered that everyone used to go ga-ga over? With the personalized names or symbols? Well the magic (ha!) 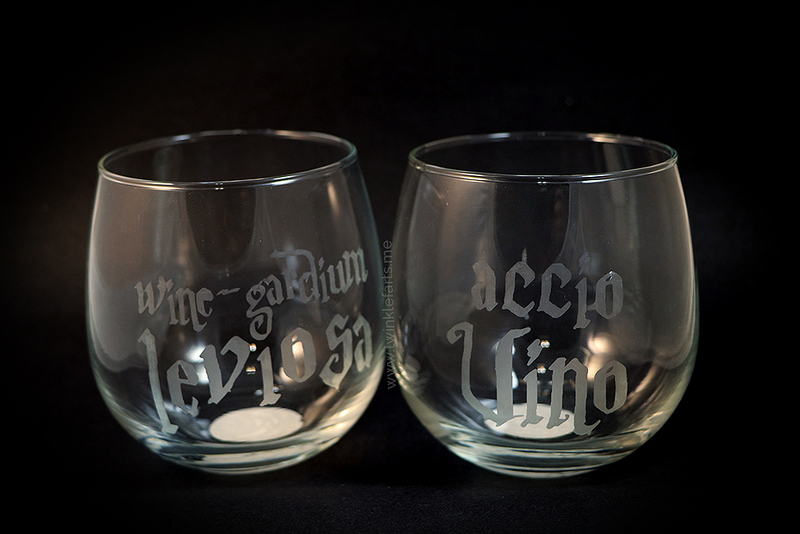 behind etching cream is that you can apply it to pretty much any glass (yes, even ones from the dollar store) and get a beautiful customized etch that is dishwasher safe! For my designs, I started in Illustrator with a Harry Potter inspired font and brainstormed a bit (I think these phrases may have come from or were heavily inspired by Pinterest). After coming up with a design I liked, I cut my vinyl and applied to my stemless wine glass. To help with this (and the etching process), I used a half a container of Play-Doh to make a moldable "surface" for the glass to lay on. Forget those specialized cradles! I've found that Play-Doh works for a variety of projects, and holds things put with little to no effort. I ended up doing two rounds of "etching" on these glasses, but compared to another project I used with only one pass, there wasn't much of a difference. I think from now on I'll skip the second etch. I've heard a thicker coat of cream works better, so I may use that advice next time. Gratuitous slow-mo pour. Mmm yes. Overall, I'm happy with how these came out and have already poured myself a glass of Cabernet Sauvignon to enjoy in them. I'm glad to report they do their job very well (almost too well..)! 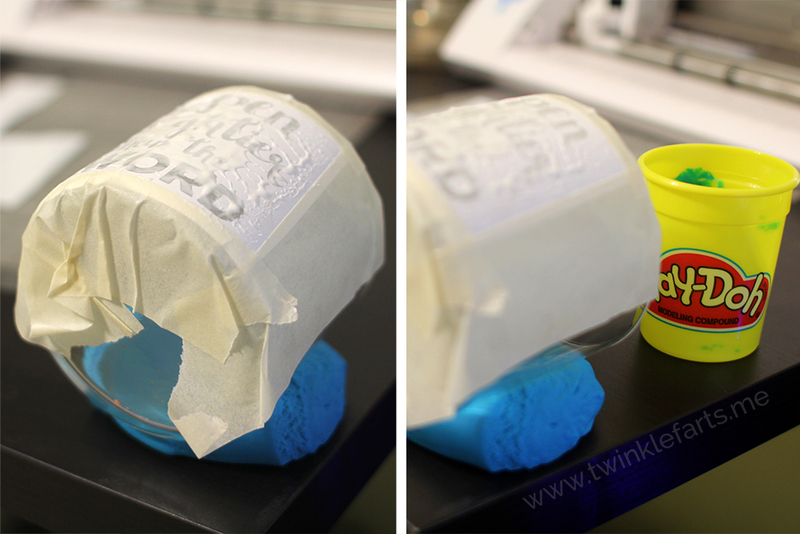 The Play-Doh trick worked so well for this project, I can't imagine doing it any other way! The etching cream needs at least 5 minutes to "etch" and this trick saved me from having to hold the glass in one place that would otherwise roll all over. It might be wise to invest in a larger size container (10oz vs the 3oz that I got) if you plan on doing more than just a few projects. I'm not sure why I only got this one, but I've read that thicker coats produce deeper etches, and I was nervous to use "too much" and run out of product and thus was more conservative with my layers. Let me know if you end up trying this super fun project out! 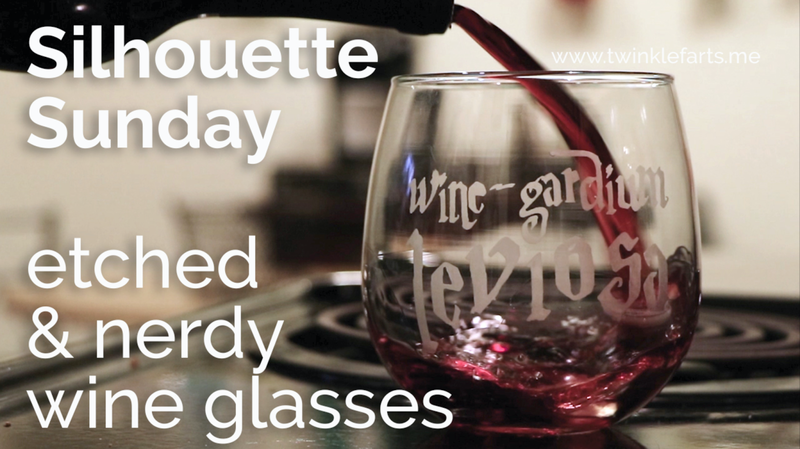 The possibilities are endless :) And here's a cut file for Silhouette software if you want to make these glasses. Have a safe and awesome 4th of July!